Below are common attributes associated to Kona Coffee Elephant Ear. Become a care taker for Kona Coffee Elephant Ear! Below are member comments regarding how to plant Kona Coffee Elephant Ear. No comments have been posted regarding how to plant Kona Coffee Elephant Ear. Be the first! Do you know how to plant Kona Coffee Elephant Ear? Below are member comments regarding how to prune Kona Coffee Elephant Ear. No comments have been posted regarding how to prune Kona Coffee Elephant Ear. Be the first! 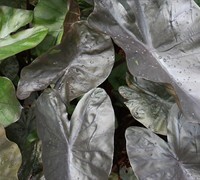 Do you know how to prune Kona Coffee Elephant Ear? Below are member comments regarding how to fertilize Kona Coffee Elephant Ear. No comments have been posted regarding how to fertilize Kona Coffee Elephant Ear. Be the first! Do you know how to fertlize and water Kona Coffee Elephant Ear? Below are member comments regarding how to deal with Kona Coffee Elephant Ear's pests and problems. No comments have been posted regarding how to deal with Kona Coffee Elephant Ear's pests and problems. Be the first! Do you know how to deal with pests and problems with Kona Coffee Elephant Ear? Looking for Kona Coffee Elephant Ear? Colocasia 'Kona Coffee' represents the 2011 introduction from master breeder, Dr. John Cho of Hawaii. This is the first dwarf plant from John's work, and could best be described as a dwarf Colocasia 'Diamond Head'. The 2' tall, fast-offsetting tight clump is topped all summer with glossy brown, coffee-colored leaves. Colocasia 'Kona Coffee' makes a great container plant or addition to flower or perennial gardens where it can be used as an accent with contrasting colors. I plant Colocasia varieties of elephant ear in well-drained moist soils and full sun to morning sun to part shade. If your soil is heavy clay mix in 25 to 50 percent organic compost or soil conditioner to 50 to 75 percent native soil removed from the planting hole. The wider you dig the hole the better: maybe 3 times the width of the container the plant was growing in or 2 to 3 feet wide. Water deeply after planting and then as needed to keep soil somewhat moist to moist. Mulch heavily if you want to water less during summer. The only pruning that will be needed is to remove damaged leaves, cutting them back to the ground. I fertilize elephant ears at planting time with a slow-release, organic plant food. If not using a slow-release plant food fertilize once every month or so during the growing season. I've seen no pest or disease problems with Colocasia varieties of elephant ears. Bugs don't seem to like the leaves.